On Earth, a new day dawned. Solar System colonization commenced as humanity finally recovered from the First Space War, but the sheer amount of Gamilon hardware discovered in the Solar System shocked Earth leaders. Fearful of a reappearance of the mysterious attackers from space, a unified Earth Defense Command (EDC) was created. Queen Polilla of the House of Gardiana made psychic contact with the living planet Phantom, the oldest living being in the galaxy. Phantom warned her of the coming war between Galman and Bolar, a war in which Shalbart and its legendary ancient weapons would become a coveted prize. 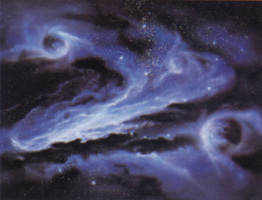 The principles of Warp travel were discovered by scientists on Dezarium. The unstable mineral Dezarium was used as a basis for this drive, despite its byproduct of hyperon radiation. The Great Return program to breach the Dark Nebula was begun. On Gamilon, Desslar IV was born. Also born was Sarjant Talan, Mastersson (“prince”) of Clan Talan. The young crown prince and the chief-to-be of the Talan clan grew up as friends. On Iscandar, Queen Astra I died. Queen Sasha II ascended to the throne. On Iscandar, Queen Sasha II died giving birth to Starsha III and her twin sister Astra. The Regency Council ruled for 18 months until Starsha III was crowned. The Great Return Program succeeded; Dezarium forces escaped from the Galaxy of Light and established bases within the Dark Nebula itself. A chance encounter with a Gamilon space probe lead them to discover the Gamilum-based Warp drive. Leader Skaldart began his expansion into our universe. 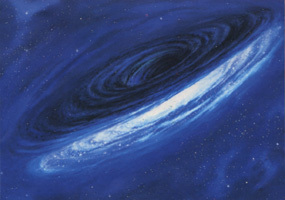 The Dark Nebula Empire was created as its forces began to penetrate the Galaxy in search of Gamilum. Acting in secret, a young Desslar IV violated religious law and made radio contact with Iscandar, specifically with the now-adult Queen Starsha III. Enchanted by her, he continued their communication. Abraham Avatar was born in Colorado, USA. In an attempt to create an immortality gene treatment, geneticists on Iscandar accidentally created a virus that killed on contact. Within days, the once-great civilization of Iscandar perished, its citizens reduced to corpses. 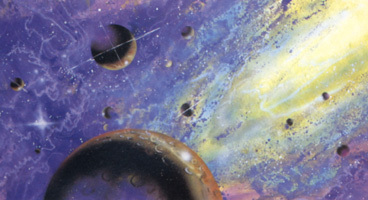 Desslar III attempted to send help to Iscandar, but was stopped by the High Priests, who reminded him that Iscandar was a Holy Planet, never to be touched. The King was forced to stand aside as the plague ravaged Iscandar. On Iscandar itself, only a few survived. In a last-ditch effort to save her people, Starsha activated the Ancients’ fantastic Cosmo DNA machine, but it was too late. The planet was cleansed of the virus, but only Starsha and her sister were left alive. Heartbroken, Desslar III abdicated in favor of his son, Desslar IV. The High Priests capitalized on the situation and seized power, attempting to kill the young King in the process. Desslar IV escaped, aided by Talan, and assumed the peasant name of Desslok. The High Priests imposed a total religious dictatorship across all of Gamilon and declared the end of the monarchy. Taking the destruction of Iscandarian culture as a sign, spacefleets were ordered to Earth’s Solar System to resume the Holy War. To feed their coffers, the Church re-introduced feudalism. The Clans were abolished and many of their nobles executed. Accompanied by Talan, Desslok gained a commission in the Gamilon military. He participated in many campaigns and gained the attention of the Commander of Gamilon’s Commonwealth Forces, a powerful Lieutenant Colonel named Dommel Lysis. Under Lysis’ tutelage, Desslok became a brilliant strategist. The two worked together to pacify Gamilon’s many conquered worlds. 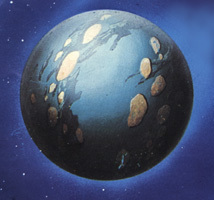 Striking from Pluto, Gamilon forces attacked Earth across a broad battlefront. This time the match was more even, and EDF forces put up a fierce struggle. The war settled into a near-stalemate as both sides vied for advantage. Stephen Sandor was born in New Sweden, Luna. A baby boy was born to Charles and Beth Wildstar of Great Island (Okinawa). The child was named Alex, an old family name. Stephen Sandor was badly injured in an amusement park accident in which his only sister died. Now a quadruple amputee, the boy was chosen to receive experimental bionic limbs. Adam Avatar (son of Abraham) was born. A second boy is born in the Wildstar family, named Derek. Leslie and Kevin Forrester of Austin, Texas, became parents of a baby girl, Nova Snow Forrester. Marcus Venture, Jr. was born to Marcus and Anna Venture, Brooklyn, New York, USA. Stephen Sandor was commissioned, assigned to the shipyard at Great Island, Japan. Alex Wildstar entered the Earth Defense Academy. General Lysis was assigned as supreme commander of all Gamilon mobile forces. Lysis chose Desslok as his replacement as the head of the Commonwealth Guards and charged him to watch over the Gamilon people in his absence. Moved by this, Desslok revealed his identity as the true King of the Gamilons. Lysis, an old-guard Royalist, swore eternal fealty to Desslok and pledged his armies in any attempt to overthrow the High Priests’ brutal reign. With Talan at his side, Desslok began to assemble a cadre of sympathetic officers and former Clan nobles. Alex Wildstar was commissioned, assigned to Cruiser EDS Harrison under Abraham Avatar. There, he met chief engineer Stephen Sandor, and the two became friends. Sandor was transferred to Okinawa Naval Shipyard. Giordi Venture was born. Desslok made his move. Royalist forces moved against key defense and munitions stations of the government on Gamilon. Backed by Lysis’ mobile forces, Desslok’s army quickly overran the planet and a new Holy Kingdom of Gamilon was declared. The High Priests, who still held the homeworld’s highly-religious masses in thrall, threatened a civil war, but Desslok end-ran them by announcing that the High Priests had been in league with the Dark Star all along and had them executed. To prove his piety to the still-faithful people of Gamilon, Desslok vowed to utterly destroy the Dark Star within ten years. To this end, he ordered the Gamilon forces fighting Earth to begin bombarding the planet with asteroids. The ploy worked, and Desslok was named Leader (“Warrior-King”) for Life. Desslok’s real ambition was to finish off Earth quickly, then, his adoration by the masses secure, to rebuild the long-dead Galman Empire with himself as God-Emperor. The first “Planet-Bombs” fell on Earth. Derek Wildstar’s parents were killed in the attack on Okinawa, as was Avatar’s wife. Derek moved in with Alex, who was reassigned to the shipyard. Alex and Sandor renewed their friendship. 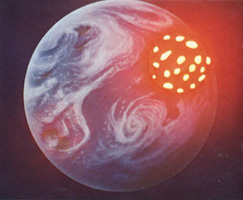 As the planet-bombings continued, Earth’s productive capacity and population were savaged. Fallout levels grew as the cobalt-seeded bombs rained upon the Earth. After taking the place of his fallen commanding officer in the midst of a battle in Saturnian space, Avatar turned the tables on his attackers and destroyed a Gamilon fleet. EDS Trafalgar limped home as the only survivor of the battle, and Avatar was promoted to Captain. Adam Wildstar entered the Space Academy on Earth. Gamilon forces took Jupiter. A ‘Floating Continent’ base was established within the giant planet. Avatar lead a squadron against Gamilon-held planetoids in the Inner Belt, destroying all of them in a hellish 2-year-long campaign. The Gamilon forward defense base within Asteroid Icarus was captured and its technology recovered intact for study. Derek Wildstar, Mark Venture, and Nova Forrester graduated from the Academy. The Underground Cities began to fill. Earth’s spacefleets were decimated in a showdown with Gamilon forces in trans-Mars space.